15% discount on all Airship 27 books, including Lance Star: Sky Ranger Vol. 1 & 2 now through Sunday, Feb. 14. Use discount code WASHINGTON. Windy City Pulp & Paper convention in Chicago. 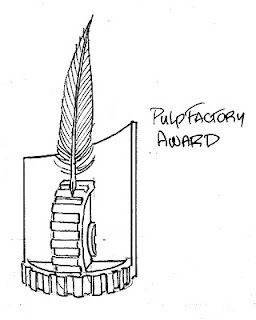 The Pulp Factory is an informal group made up of both professional writers and artists and dedicated fans of the pulp genre. These awards were created to help recognize and promote new work, both fiction and art, in this classic American literary field. Ron Fortier is the group’s moderator. The Pulp Factory is not affiliated with any single publishing organization and many of its members have contributed to dozens of well known pulp markets. “For too long the pulp community has only focused on rewarding old time creators,” Fortier said. “Yet in recent years we’ve seen a huge resurgence in new material by some of the brightest writers and artists working today. But no one was acknowledging their contributions and we thought it was time to remedy that omission.” The group hopes the awards will spur new interest in the genre and inspire other creators to enter the pulp world. By Andrew Salmon – from Sherlock Holmes-Consulting Detective Vol. One. MARK MADDOX – for Sherlock Holmes – Consulting Detective Vol. One.